If you're Canadian, you know exactly what I'm talking about. If not, I'm terribly sorry that you had to spend your teenage years without the comfort of a great public television show featuring others as zitty and angsty as yourself. It may not sound like a winner, but it was great. Latecomers who try to get into Degrassi in their post-highschool years often don't - can't - understand the appeal. Part of the power of the show was undoubtedly the empathy it inspired in its teenaged viewers. While the premise of most television shows is based on a sort of voyeuristic longing, Degrassi was less about peering into the lives of the upper class, and more about peering into your own house. For those of us who tuned in to the CBC weekdays at 4, this series is for you. The series is a mix of ink, graphite, acrylic gel, pastel, oil, acrylic, and collage. I was going for something that would look illustration-like and flat from a distance, but would reveal a greater complexity close up. And my personal favourite (as a character) - Caitlin. 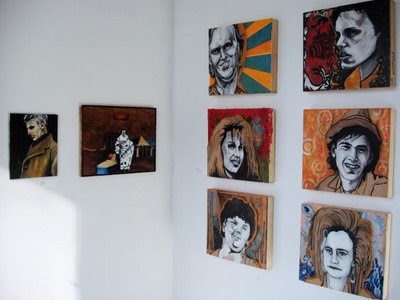 View of the series as installed at the Concordia University Painting and Drawing Students Association show on Crescent Street in Montreal, 2007. #1 fan reporting for duty with praise and a couple of OMGs. I just watched the entire series again. My teenage sister laughed at the hair, clothes and glasses. I am probably THE hugest fan of the next generation & I even had the honor of going to set this summer... but i am also a pretty big fan of the originals like junior high and these are amazing!!!! i mean your work is great but the fact that someone else shares such a love for degrassi makes me smile ! good luck in future work & once again this is great!! Thanks so much Alyssa! I haven't ever watched the new Degrassi, being a child of the 80s, but I am glad to know that the awesome-ness is continuing. Like I said, I feel sorry for Americans and the few Canadians who somehow never saw this show. It's pretty much the greatest thing to have graced TV...well, ever.